You are at:Home»Cultivation»Why are the Leaves Falling Off My Jade Plant? Why are the Leaves Falling Off My Jade Plant? Crassula ovata, commonly known as Jade Plant, is one of the most common houseplants. With their thick, woody stems and oval-shaped leaves, Jade Plants have a miniature, tree-like appearance that makes them very appealing for use as a decorative houseplant. They live for a very long time, often being passed down from generation to generation and reaching heights of 3 feet (90 cm) or more when grown indoors. As your Jade Plant grows, it will naturally drop older leaves. An increase in the rate of leaf loss, however, may indicate a problem. To fix it, you may need to adjust your watering schedule and check your plant for pests. Low light and cold temperatures may also be to blame. Jade Plants don’t like wet feet and are vulnerable to root rot. Never leave your plant’s pot in standing water. Check the soil if its leaves turn yellow and start to drop off. If it is damp or soggy, withhold water until the soil dries out completely. If you notice soft sections on the Jade Plant’s trunk or branches, remove the plant from its pot and wash the soil away from the roots. Cut off any soft branches or roots and then repot the plant in a potting mix for succulents. Use a clean pot when replanting your Jade Plant in case the rot is the result of a fungal infection. Plants that are not receiving enough water often shed their leaves rapidly. If the lower leaves on your Jade Plant are shriveling up and then falling off, check the soil. If it is completely dry, water your plant thoroughly. Water a Jade Plant every time the top inch (2.5 cm) of its soil is dries out. These plants add leaves and shoots during the summer and need more water during those months. The plant will use less water in the winter but will still need a drink every now and then. If your Jade Plant is losing its leaves at the beginning of winter, it is probably not getting enough light. Move your plant closer to a window but keep it a few inches away from the glass. Winter drafts are just as damaging as low light. If you fear your window is too cold or drafty for the plant, supplement the light it receives with an artificial light source. Jade Plants do best at temperatures between 55 and 75 °F (13 and 24 °C). Frost will kill the plant, but both colder and warmer temperatures can cause leaf drop. Keep an eye on the thermometer all year, keeping your plant away from drafts and radiators both. A sudden change in temperature caused by a move will also cause leaf drop. The leaves will grow back once your plant has adapted to its new surroundings. To prevent this, gradually acclimate your plant to a new location by placing it there only for a few hours at a time. Gradually increase the length of time your Jade Plant stays in its new location before making the switch permanently. These plants are vulnerable to infestations of mealybugs and scale insect. 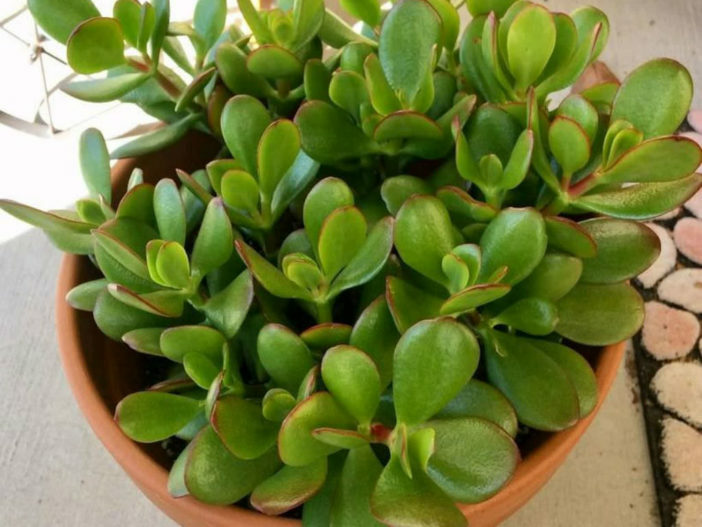 These pests make Jade Plant leaves sticky and can encourage the growth of molds. They also cause leaf drop and deformed leaves. Treat mealybugs and and scales by dabbing them with a paintbrush or cotton ball dipped in rubbing alcohol. Avoid insecticidal soaps and sprays as they can damage the plant itself. Treat any pests you find daily until they are gone.